It is waking up in the morning and pinching yourself black-and-blue that OMG, this is my life, and it is freaking awesome. Make no mistake, UNSCRIPTED is not about some trendy new marketing tactic that becomes ineffectively overused within months. It's not about fifty-year stock-market fantasies or depriving yourself of life's luxuries; Amazon already has a gazillion books on such trash. 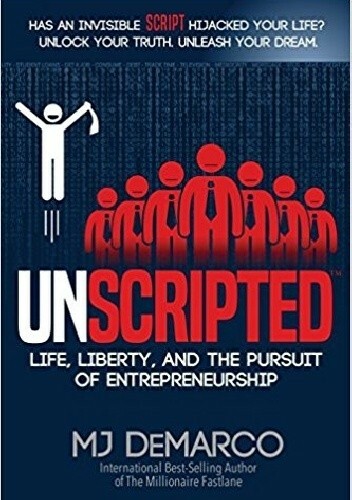 I wrote UNSCRIPTED to change your life. So, if you are ready for the challenge, get ready for a sh*t-your-pants revelation that everything you have been taught is bullsh*t. Legendary bullsh*t. Paradigm shift? Heck no. The problem is the paradigm itself. You have allowed the paradigm to set the rules, call the shots, and dictate the decisions. The problem is, you have allowed ordinary thinking preached by ordinary people to produce exactly that; an ordinary life. The paradigm shift is realizing the paradigm is sh*t.